I’m going for Serena to win the Calendar Slam. It’s hard to imagine the pressure Serena will be under over the next two weeks but I honestly believe that if anyone can deal with it then it’s Serena. I’m sure there will be one or two matches where Serena is on the brink. As much as the pressure is on Serena, it will take an incredibly gutsy performance from anyone to beat her in New York. Serena won the French Open not playing close to her best and she did this to a degree in Cincy, taking advantage of a reasonably favourable draw but still beating two top 10 players along the way. 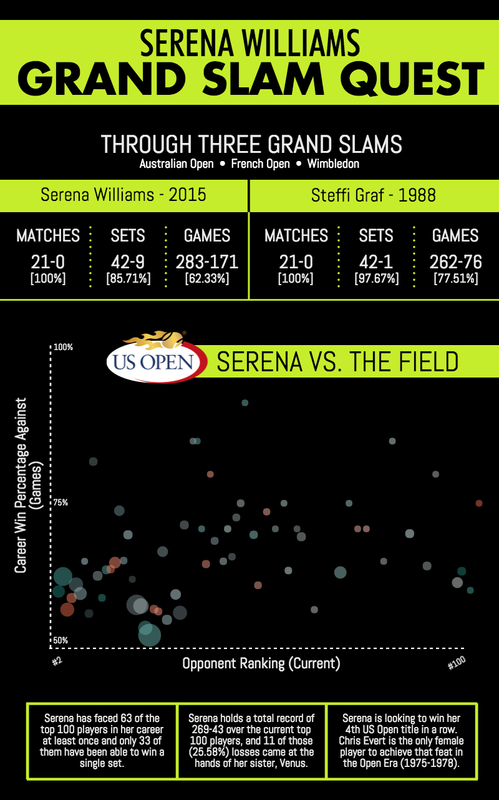 The US Open has been Serena’s most consistent Slam in the last few years where she has reached the final in the last four years and been crowned champion in the last three. I felt after Wimbledon this was Serena’s and I haven’t changed my mind. I’ve been predicting Azarenka to do well at quite a few tournaments this year although it hasn’t quite worked out for her. This is a risky one because Azarenka was forced to pull out of Cincy with a leg injury; however she’s been practising without any of the heavy strapping and when she’s healthy, has looked good this year. Half of her losses in 2015 have come against Serena or Maria. Not drawing Serena in her half is a big boost and I think the loss to Errani in Canada was a big wake-up call. I lingered between Azarenka and Safarova in the fourth round for a while but in the end, head ruled over heart. If Azarenka-Kerber happens in the third round, i’m finding it hard to see Angie winning that one with the head-to-head and the Angie’s struggles at getting past that stage of the Slams this year. Originally, I ended up with Sharapova and Muguruza in my semi-finals… however i’ve been changing my mind left, right and centre. This is always a dangerous thing to do! In the third quarter, Wozniacki is the safest pick to the semis IMO. I’d love to see Kvitova do something after her superb performances in New Haven, but Petra is Petra and I could easily see her coming unstuck in an early round, perhaps scheduled in the daytime. I’m not entirely convinced by Wozniacki’s fitness with the leg injury although she has said in press that it’s fine. Wozniacki has a decent draw and although there are some seeded players who have done well at the US Open in her section, she has winning head-to-heads against them all. There was much deliberation on the quarter-finalist from the first section… in the end, i’ve gone for Bencic. She did well here last year and that run in Toronto-Cincy was stunning. I’ve taken the plunge despite a potential third rounder against Venus where she is 0-3 in the head-to-head and 0-6 in sets. I do have to remind myself that Venus did go out to Sara Errani here last year and her recent form has been disappointing. Furthermore, Bencic has been superb at turning around losing head-to-heads and learning quickly what she needs to do to improve. Garbine Muguruza parts ways with coach Alejo Mancisidor after more than two years of working together. Halep is the safest pick to the quarters. She turned her year around with superb performances in Canada and Cincy. I think she will do well here and the confidence from the past couple of weeks should spur her on. For some reason, which I can’t quite put my finger on, i’m not completely sold. For further coverage of the US Open, check out the Moo’s Tennis Blog Facebook and Twitter pages. 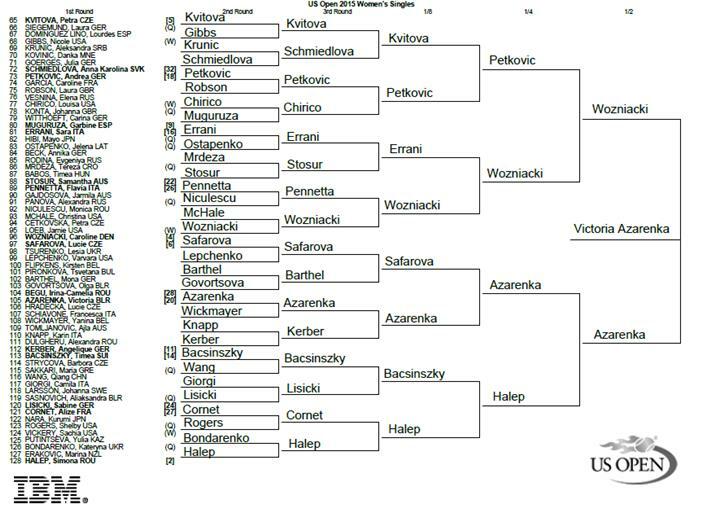 With all the big names in the top half the bottom half will be a bit of a mess and Kerber is due a run somewhere and this was her breakout tournament in 2011 so why not? 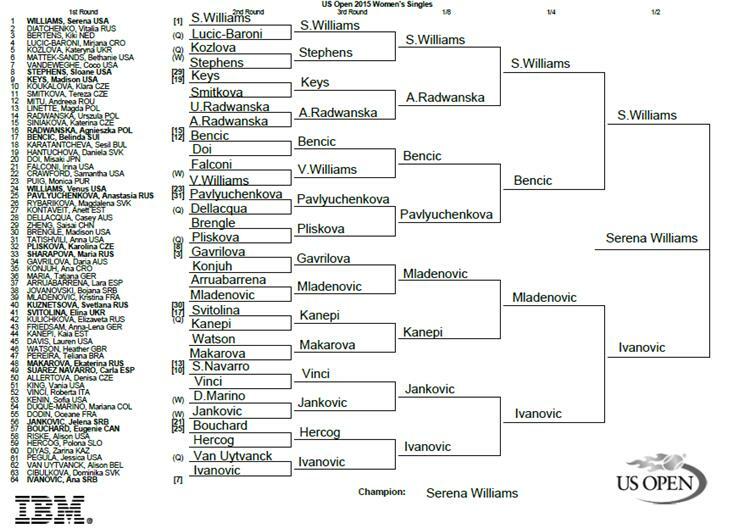 Well with Sharapova out that section of the draw opens up even more. A healthy Makarova would take advantage of that as would Kuznetsova but both have missed tournaments with injuries in recent weeks. So I think I will agree with you and have Mladenovic in the quarters another player due a run at a major. Even though it would not surprise me if it is actually Kanepi or Gavrilova. You think Ivanovic could make the semi’s? She’s only ever gone to the QF stage here but I guess it’s not impossible. I think her game is best suited to a fast hard court even though she likes clay most. She has some of the best natural instincts on the tour from the back of the court, it’s when she over thinks that she usually over hits. I’d like to see Angie do well also! hey guys im looking forward to the us open! can anyone tell me why or disagree on these picks of james (or whoevers) as i think the other opponent will win. I have already done this for the mens on tenngrand, i just want to try and understand these picks. Even though we all know that at least one of these matches will end like this, i think at least 2/3 of them you have gotten wrong. And so…it begins… the first round matches have all the answers. It’s nice to see Cibulkova back on the courts again after an injury layoff – I think she will have a very good chance to take out Ivanovic in the first round, as Ivanovic has had ups & downs this year without winning any titles so far. Bencic also was very good when she beat Serena in Toronto, but with her wrist injury in Cincinnati, I don’t think she’ll be able to make it to the quarterfinals like she did last year as Venus is in her section of the draw. Azarenka looks to be back on track, but her game will be questionable, with the thigh injury she suffered in Cincinnati, though I believe she can beat Halep. Seems to me Muguruza is having the same struggles-with-form season that Bouchard had after last year and I think she may very well likely drop out of the top 10 after the end of this year. Kvitova is also a strong player, especially with her powerful lefty-forehand. But, she hasn’t done well this year, especially with her mono diagnosis. I believe Serena can and will be able to win this title. Thanks for the comment, Jackie. I remain undecided on Muguruza since she’s only played two tournaments since Wimby. I read that she’s left her long-term coach which seems rather sudden. Her game is a bit hit-and-miss but still, I’d be very surprised if her form goes completely the way of Bouchard. will be witnessing an incredible time in tennis history if Serena can win the USO and win the calendar slam. I also have Vika to meet Serena in the final,hopefully her leg prevails,which has been heavily bandaged.Petra is still feeling the effects of mono,even after her win yesterday,the hot humid conditions in NYC,have never suited Petra.I have been impressed with Halep recently on the HC,can Halep repeat the same at NYC? I still have a question mark? also Caroline who is defending finalists points from last year? Serena Williams to win her 22nd Grand Slam title and to complete the calendar slam in 2015. Look back at all your previous predictions over the year. You predicted at most of the tournaments that Azarenka will go at lest to SF. And did she? No. I think that next year will be all about Azarenka. And also despite her up and down form, I think Ivanovic and maybe Bencic(again) are only players that can cope with Serena. Ivanovic is always one step closer to win and yet she loses. But theirs matches are always big ones. Im also a big fan of Vika to. She is kind of player who when step on the court, its all about her. Her aggressive game and big shots are her trademark. But she is not there yet. She beat Kvitova in Toronto in 2nd round and then lost to Errani, who(we must admit) is peace of cake for “old” Azarenka. I think she is not mentally and physically(she retired in third round in Cincinnati vs Pavlychenkova). So lets give her some time. 2016 is her big comeback year. I saw you went for Vinci! Risky pick but I can understand it. Indeed! Especially now that most of the seeds are gone from that section. I’m also with Serena (350€ outright on her @2.2), I also foresee Vika as the finalist but for,me Wozniacki won’t qualify for the second week, she is really weak at the moment, I’d go for Petra vs Vika and Serena vs a surprise in the semis. Good Luck and COME ON SERENA you can do it ! it seems to me that everyone around the world think Serena will win but for sure it will not be so easy for her.i am sure she can deal with the pressure to make history at US Open but every player she‘ll face will do her best and more to be the one who stop her and make the headlines all over the world.my prediction for the final is Serena versus Halep.i picked Halep for the final despite my rooting for Vika coz Halep have a great year on hard and she seems to get her play back together after clay and grass season.Serena have the first chance over Halep in the final but if the romanian can shake off her obvious respect for Serena she can prevail in this final. Perfect Final: Serena (elbow free) goes on a tear, gets to final. Ha! It’s Petra( sans mono). Tough 3-setter, Serena edges it just in the third. Collapses on her knees… in the crowd, Graf, Navratilova…and Sharapova(why not!). But, the world is not perfect. Satisfying win: Halep or Caroline, mostly Wozniacki, it’s been a long time coming. Pleasantly surprised finalist: Kerber or Timea B. Fairy tale winner: Lucie or Belinda probably more Bencic because she is still ‘doe-eyed’. I think Lucie will fall apart if she wins…the occasion, the achievement, maybe just too much feelings. Dark horse: Everyone except Serena and Maria who is injured. I want to go for Ana but surely, cometh the hour, after all the wishing and praying, she will be possessed by the ‘headcase’ and it will end in fist pumps and tears. That combo is just not right. I’m also not too keen on seeing a tired Halep in the final. I hope she peaks at the appropriate match. I think I’m going Serena v Halep final, with Bencic and Wozniacki as my substitutes in the two halves of the draw. Unfortunately, now I find the women’s final to be more predictable than I thought before. Serena had found a way to win against Venus in three sets in the quarterfinals. Now, she can and will find a way to win against Vinci in straight sets. Halep is battling a leg injury and unlike Serena, she has to play her quarterfinal and semifinal matches back-to-back whereas Serena has had a day off between both her matches. So, I have a feeling if she faces Serena in the final, the scoreline may be 6-3 6-4, 6-3 6-2, or 6-3 6-0.